A new virtual assistant brings EHR data to the point of care. Peter Durlach, senior vice president of marketing and strategy for Nuance Communications, Inc, says health care is beginning to catch up to consumer technology. Over the past several years, Nuance has been working on a virtual assistant for health care that mimics some of the search functions commonly associated with Siri, Alexa, and Google Assistant. Durlach says health care organizations initially weren't all that interested in virtual assistants, but, as the technology has caught on with the general public, providers have begun to see it as a means to improve workflow. "The consumer awareness of virtual agents has become much more prevalent over the last two years, and the physician burnout administrative overhead problem is just completely crushing people in the health care sector," Durlach says. "Doctors and nurses don't have any time to do anything, and they're frustrated, especially with all of the documentation needs. 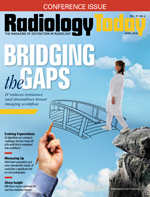 Even in radiology, you're starting to see a lot of burnout—too many exams to read, too short of time, and searching for information in the EHR is a pain." At HIMSS 2018, Nuance announced that it will partner with Epic to integrate a virtual assistant with Epic's EpicCare EHR. Durlach says the virtual assistant, which uses natural language processing to understand speech, will be used with three applications in 2018: Epic Rover, Epic Cadence, and Epic Haiku. Epic Rover is a documentation system for nurses; the virtual assistant, which runs on iOS- or Android-enabled mobile devices, will allow users to verbally request flowsheets and confirm patient information. Epic Cadence is a scheduling application; staff will be able to verbally set up patient appointments and check physician schedules through their desktop computers. Epic Haiku, which has the most relevance for radiologists, is a mobile dictation app; users will be able to request patient information such as lab results, medication lists, or visit summaries on iOS- or Android-enabled devices. "We have already used some advanced artificial intelligence technology to provide capabilities for automatic structured feedback while the radiologist is dictating, to start pulling out structured data from the [unstructured] notes to drive more standardized reporting and better quality in clinical guidelines, and we're planning to add virtual agent capabilities into the radiology domain, although we don't have radiology-specific features at this time," Durlach says. The cloud-based, HIPAA-compliant virtual assistant has a response time of less than half a second, Durlach says. Users who are already signed in to one of the applications can use it without any additional sign-in. Because radiologists are facing the same pressures as other physicians, the virtual assistant may prove valuable for them, says Karen Holzberger, vice president and general manager of diagnostic solutions at Nuance. "A virtual agent can assist by actually gleaning out the most important information such as why the patient is back, what the findings were, and what recommendations were made previously, so that the radiologist who's reading that exam, which may not be in front of him or her, can get to the heart of the findings, the interpretation, then the next set of recommendations to take care of that patient," Holzberger says. "With the use of the virtual agent, you can ask the EHR a question: 'What was the last surgical note?' What was the last lab result?' The radiologist wants to make a more informed decision, and all of that information is in the EHR today, but radiologists don't have time to dig through the EHR to find that one piece of information that he or she will use to make a better decision." The virtual assistant also scans previous reports and extracts previously requested types of data before the radiologist reads a new case. Holzberger says Nuance's goal is to minimize workflow disruption so physicians can find the information they need without spending additional time looking for it. She believes the virtual assistant accomplishes that goal and will help improve patient care in the process. "We really see a world where the radiologist is going to have many more opportunities to access all of the information that's been available that's either been locked into the EHR or locked into the previous unstructured text of the report and put all of that together in a structured way that then can drive different care pathways," Holzberger says.